​In May of 2016, Council approved the creation of the Montreal 1642 Tartan. Less than a year later, in March 2017, the Society unveiled the tartan and gifted it to the City and the citizens of Montreal at a reception at City Hall, inviting all Montrealers from every background to join together as one clan. This was no small undertaking to accomplish—following through from an idea to design to fabrication. The tartan was only made possible by the efforts of members of our Society and their dedication to its realization. This is the story of how the Montreal 1642 tartan came to be, and the path it took to become a reality. In 2016, SAS council member Sean Smith approached then-President Brian MacKenzie with the idea of creating a tartan that would launch in 2017, celebrating Canada’s 150th, Montreal's 375th, and the Montreal Highland Games' 40th anniversaries. The concept was presented to Council and a committee was formed with the following Council members and past presidents: Sean Smith, Moira Barclay-Fernie, Campbell Oliver, Peter McAuslan and Brian Mackenzie. Campbell Oliver spearheaded the tartan design and established contact with Lochcarron of Scotland, a leading manufacturer of tartan, while Sean Smith and Peter McAuslan worked on a description that was inclusive of all Montrealers—one that would represent the founding cultural groups and the City’s modern diversity. This description was later used for the official plaque, produced by Graveur Renaud, that now hangs at Montreal’s City Hall. In February, Mayor Denis Coderre was fitted for a Montreal 1642 tartan sports coat by Glen Nobes of Henry Marks and Sons; this coat was presented to him at the official City Hall presentation in late March. Soon afterwards, orders for kilts, trews, scarves, sashes and ties made with 1642 tartan started to roll in. Working with Glen Nobes, the Society began manufacturing items for sale. At the St. Patrick’s Parade on March 19, the tartan was first worn officially by our members, and a banner was created with the tartan being featured. 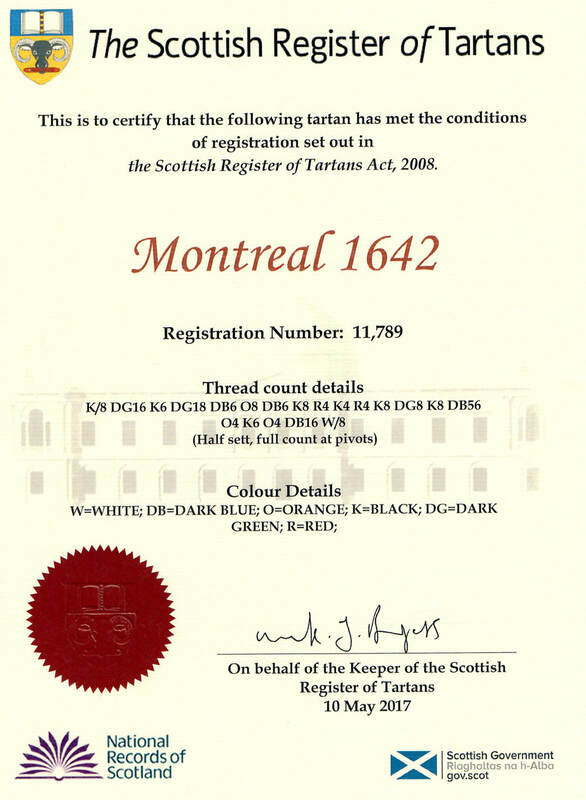 ​On March 27, Brian MacKenzie presented the Montreal 1642 tartan to Mayor Denis Coderre and his City Councillors, and the tartan was officially adopted by the City of Montreal. During the Black Watch Military Tattoo at the Bell Centre on April 8, the tartan was featured on overhead screens during the show and worn by some members in the VIP section. In May 2017, the St. Andrew’s office received the tartan registry certificate from the Scottish Register of Tartans.